is a tourist destination positioned in the Dindigul district in the Indian state of Tamil Nadu. Gratified with all forms of natural beauty including enchanting lakes, huge rocks, majestic hills, roaring waterfalls and lush flora and fauna, Kodaikanal is a must visit site while on your tour to South India. Kodaikanal Lake: Kodaikanal is a 60 acres manmade lake constructed by Sir Vere Hentry Levinge in 1863. Visitors can relish several activities while on this lake including angling and boating (row boats and pedal boats). One can also hire and ride bicycles and horse around the 5 km beautifully adorned path which surrounds the lake. Climb the nearby 122 meters high Pillar Rock to get a mesmerizing view of the Kodai valley. 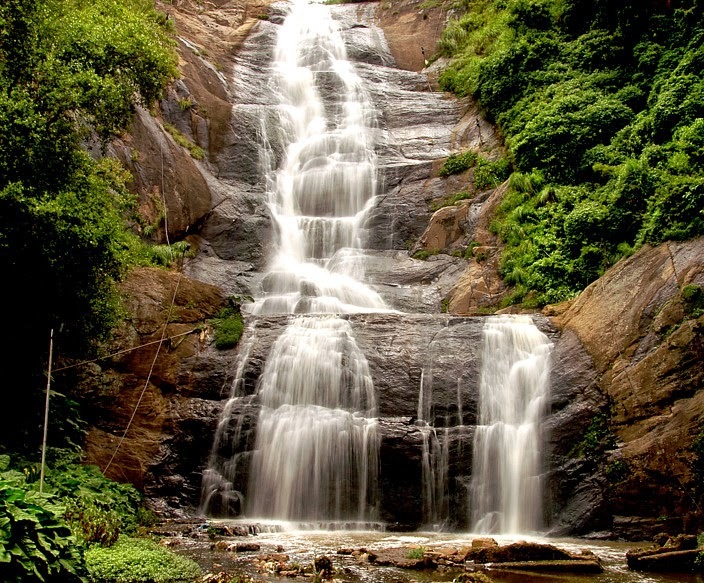 Bear Shola Falls and Silver Cascade Falls: Placed km away from the Kodai Lake, Bear Shola Falls is the place where bears used to come to quench their thirst. But now it remains one of the popular picnic spots for the locals as well as foreigners who visit this place to relish a joyous time with their friends and family. Silver Cascade Falls is a delightful fall placed at an expanse of 8 km from the main town. You can witness the roaring waterfall flowing from a height of 180 feet amidst the nature and tranquility which is a joy ride for every nature lover. It is formed by the outflow of Kodai Lake. Coaker’s Walk: Coaker’s Walk is a 1 km long paved walker placed on the southern side of Kodai which runs along the rim of the precipitous slopes. Starting from the Van Allen Hospital, the path runs equivalent to the hospital road and joins the St. Peter’s Church offering a picturesque view of the pains to visitors including the view of Madurai on a clear sunny day. Named after Lt. Coaker who prepared the map of Kodaikanal town, the rare phenomenon about walking in this place is that you can see your silhouette on the clouds with a rainbow corona. For this, the clouds and vapor should be at the front and the sun at your back. Bryant Park: Spread over an area of 20.5 acres, Bryant Park houses 325 species of trees, cactuses and shrubs and about 700 varieties of roses. The major attractions of this park are the 1857 Bodhi tree and the eucalyptus tree which adds spiritual importance to this park. Placed 500 meters from the Kodai bus stand, the park organizes an annual horticulture show in the month of May during which a visitor can witness a colourful riot of mesmerizing and captivating flowers. It was constructed by H.D. Bryant (Madurai Forest Officer) in 1908 due to which it was named after him. Kurinji Andavar Murugan Temple: devoted to Sri Kurinji Easwaran (Lord Murugan), this temple placed 4 km away from the Kodai bust stand is famed for the Kurinji flower which blooms in every 12 years. It was constructed by a European lady in 1936 who after coming to Ceylon transformed to Hinduism. The major religions of Kodaikanal are Hinduism, Muslim and Christianity with some numbers of Tibetan Buddhist refugees. Pongal, Jallikkattu, Miladi Sherif, Deepavali and Natyanjali are the renowned religious festivals while Tea and Tourism festival and Summer Festival are communal celebrations of Kodaikanal. The most worth mentioning languages spoken in Kodaikanal are Tamil and English. Tourism industry, cattle husbandry, plantations and agriculture are the major occupations. Homemade chocolates, marshmallows, peanut butter, coffee, spices, jam, flowers, eucalyptus oil, herbal oils, aromatic oils, winter oil, Tibetan warm clothes, handicrafts, embroidery, leather items, jewellery and bone and walnut wood articles are the items that can be purchased from this place. Kodai offers visitors with Italian, Chinese, North Indian and wide varieties of South Indian cuisines. Accommodation: Kodaikanal has large number of accommodations option from home stay, resort to luxurious hotels all of which are heavily facilitated and serviced to meet every demand and desire of customer. The Carlton (5 star), Hotel Mount View (3 star) and Hotel Gurupriya (2 star) are some of the hotels which you can opt to stay while in Kodaikanal. Best time to Visit: The climate of Kodaikanal is defined as sub-tropical with minimum temperature of 8°C and maximum temperature of 30°C in winters (November to January), 20°C to 34°C in summer (March to May) and monsoons (June to September). So, the best time to visit this place is from the month of September to May.